Securing a Linux environment begins with the workstation. Whether locking down a personal machine or securing an enterprise system, sound security policy begins with the individual computer. A computer network is only as secure as its weakest node. BIOS and Boot Loader Security — Can an unauthorized user physically access the machine and boot into single user or rescue mode without a password? Password Security — How secure are the user account passwords on the machine? Administrative Controls — Who has an account on the system and how much administrative control do they have? Available Network Services — What services are listening for requests from the network and should they be running at all? Personal Firewalls — What type of firewall, if any, is necessary? Security Enhanced Communication Tools — Which tools should be used to communicate between workstations and which should be avoided? Preventing Changes to BIOS Settings — If an intruder has access to the BIOS, they can set it to boot from a diskette or CD-ROM. This makes it possible for them to enter rescue mode or single user mode, which in turn allows them to start arbitrary processes on the system or copy sensitive data. Other architectures use different programs to perform low-level tasks roughly equivalent to those of the BIOS on x86 systems. For instance, Intel® Itanium™ computers use the Extensible Firmware Interface (EFI) shell. For instructions on password protecting BIOS-like programs on other architectures, refer to the manufacturer's instructions. Preventing Access to the GRUB Console — If the machine uses GRUB as its boot loader, an attacker can use the GRUB editor interface to change its configuration or to gather information using the cat command. Preventing Access to Insecure Operating Systems — If it is a dual-boot system, an attacker can select an operating system at boot time (for example, DOS), which ignores access controls and file permissions. Red Hat Enterprise Linux ships with the GRUB boot loader on the x86 platform. For a detailed look at GRUB, refer to the Red Hat Installation Guide. When prompted, type the GRUB password and press Enter. This returns an MD5 hash of the password. Replace <password-hash> with the value returned by /sbin/grub-md5-crypt. The next time the system boots, the GRUB menu prevents access to the editor or command interface without first pressing p followed by the GRUB password. Unfortunately, this solution does not prevent an attacker from booting into an insecure operating system in a dual-boot environment. For this, a different part of the /boot/grub/grub.conf file must be edited. Look for the title line of the operating system that you want to secure, and add a line with the lock directive immediately beneath it. A password line must be present in the main section of the /boot/grub/grub.conf file for this method to work properly. Otherwise, an attacker can access the GRUB editor interface and remove the lock line. To create a different password for a particular kernel or operating system, add a lock line to the stanza, followed by a password line. Passwords are the primary method that Red Hat Enterprise Linux uses to verify a user's identity. This is why password security is so important for protection of the user, the workstation, and the network. For security purposes, the installation program configures the system to use Message-Digest Algorithm (MD5) and shadow passwords. It is highly recommended that you do not alter these settings. If MD5 passwords are deselected during installation, the older Data Encryption Standard (DES) format is used. This format limits passwords to eight alphanumeric characters (disallowing punctuation and other special characters), and provides a modest 56-bit level of encryption. Do Not Use Only Words or Numbers — Never use only numbers or words in a password. Do Not Use Recognizable Words — Words such as proper names, dictionary words, or even terms from television shows or novels should be avoided, even if they are bookended with numbers. Do Not Use Words in Foreign Languages — Password cracking programs often check against word lists that encompass dictionaries of many languages. Relying on foreign languages for secure passwords is not secure. Do Not Use Hacker Terminology — If you think you are elite because you use hacker terminology — also called l337 (LEET) speak — in your password, think again. Many word lists include LEET speak. Do Not Invert Recognizable Words — Good password checkers always reverse common words, so inverting a bad password does not make it any more secure. Do Not Write Down Your Password — Never store a password on paper. It is much safer to memorize it. Do Not Use the Same Password For All Machines — It is important to make separate passwords for each machine. This way if one system is compromised, all of your machines are not immediately at risk. Make the Password at Least Eight Characters Long — The longer the password, the better. If using MD5 passwords, it should be 15 characters or longer. With DES passwords, use the maximum length (eight characters). Mix Upper and Lower Case Letters — Red Hat Enterprise Linux is case sensitive, so mix cases to enhance the strength of the password. Mix Letters and Numbers — Adding numbers to passwords, especially when added to the middle (not just at the beginning or the end), can enhance password strength. Include Non-Alphanumeric Characters — Special characters such as &, $, and > can greatly improve the strength of a password (this is not possible if using DES passwords). Pick a Password You Can Remember — The best password in the world does little good if you cannot remember it; use acronyms or other mnemonic devices to aid in memorizing passwords. With all these rules, it may seem difficult to create a password that meets all of the criteria for good passwords while avoiding the traits of a bad one. Fortunately, there are some steps you can take to generate an easily-remembered, secure password. Finally, do not use the example password above for any systems, ever. If an organization has a large number of users, the system administrators have two basic options available to force the use of good passwords. They can create passwords for the user, or they can let users create their own passwords, while verifying the passwords are of acceptable quality. Creating the passwords for the users ensures that the passwords are good, but it becomes a daunting task as the organization grows. It also increases the risk of users writing their passwords down. For these reasons, most system administrators prefer to have the users create their own passwords, but actively verify that the passwords are good and, in some cases, force users to change their passwords periodically through password aging. To protect the network from intrusion it is a good idea for system administrators to verify that the passwords used within an organization are strong ones. When users are asked to create or change passwords, they can use the command line application passwd, which is Pluggable Authentication Manager (PAM) aware and therefore checks to see if the password is too short or otherwise easy to crack. This check is performed using the pam_cracklib.so PAM module. Since PAM is customizable, it is possible to add more password integrity checkers, such as pam_passwdqc (available from https://www.openwall.com/passwdqc/) or to write a new module. For a list of available PAM modules, refer to https://www.kernel.org/pub/linux/libs/pam/modules.html. For more information about PAM, refer to Section 42.4, “Pluggable Authentication Modules (PAM)”. The password check that is performed at the time of their creation does not discover bad passwords as effectively as running a password cracking program against the passwords. None of these tools are supplied with Red Hat Enterprise Linux and are therefore not supported by Red Hat, Inc. in any way. John The Ripper — A fast and flexible password cracking program. It allows the use of multiple word lists and is capable of brute-force password cracking. It is available online at https://www.openwall.com/john/. Crack — Perhaps the most well known password cracking software, Crack is also very fast, though not as easy to use as John The Ripper. It can be found online at https://www.crypticide.com/users/alecm/. Slurpie — Slurpie is similar to John The Ripper and Crack, but it is designed to run on multiple computers simultaneously, creating a distributed password cracking attack. It can be found along with a number of other distributed attack security evaluation tools online at https://www.ussrback.com/distributed.htm. Always get authorization in writing before attempting to crack passwords within an organization. 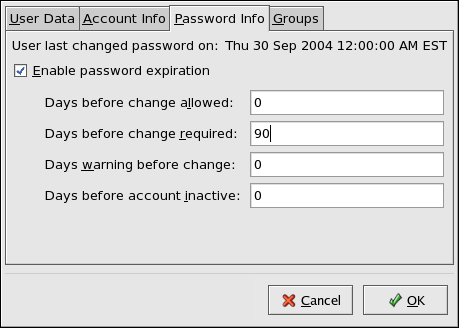 There are two primary programs used to specify password aging under Red Hat Enterprise Linux: the chage command or the graphical User Manager (system-config-users) application. In the above command, replace <username> with the name of the user. To disable password expiration, it is traditional to use a value of 99999 after the -M option (this equates to a little over 273 years). Refer to the man page for chage for more information on the available options. You can also use the graphical User Manager application to create password aging policies, as follows. Note: you need Administrator privileges to perform this procedure. Click the System menu on the Panel, point to Administration and then click Users and Groups to display the User Manager. Alternatively, type the command system-config-users at a shell prompt. Click the Users tab, and select the required user in the list of users. Click Properties on the toolbar to display the User Properties dialog box (or choose Properties on the File menu). Click the Password Info tab, and select the check box for Enable password expiration. Enter the required value in the Days before change required field, and click OK.
For more information about user and group configuration (including instructions on forcing first time passwords), refer to Chapter 32, Users and Groups. For the system administrators of an organization, however, choices must be made as to how much administrative access users within the organization should have to their machine. Through a PAM module called pam_console.so, some activities normally reserved only for the root user, such as rebooting and mounting removable media are allowed for the first user that logs in at the physical console (refer to Section 42.4, “Pluggable Authentication Modules (PAM)” for more information about the pam_console.so module.) However, other important system administration tasks, such as altering network settings, configuring a new mouse, or mounting network devices, are not possible without administrative privileges. As a result, system administrators must decide how much access the users on their network should receive. Running Email Attachments As Root — Although rare, email viruses that affect Linux do exist. The only time they are a threat, however, is when they are run by the root user. Changing the root shell. Edit the /etc/passwd file and change the shell from /bin/bash to /sbin/nologin. Prevents access to the root shell and logs any such attempts. Programs that do not require a shell, such as FTP clients, mail clients, and many setuid programs. Disabling root access via any console device (tty). An empty /etc/securetty file prevents root login on any devices attached to the computer. Programs that do not log in as root, but perform administrative tasks through setuid or other mechanisms. Disabling root SSH logins. Edit the /etc/ssh/sshd_config file and set the PermitRootLogin parameter to no. This only prevents root access to the OpenSSH suite of tools. Prevents root access to network services that are PAM aware. [a] Refer to Section 42.1.4.2.4, “Disabling Root Using PAM” for details. To prevent users from logging in directly as root, the system administrator can set the root account's shell to /sbin/nologin in the /etc/passwd file. This prevents access to the root account through commands that require a shell, such as the su and the ssh commands. Programs that do not require access to the shell, such as email clients or the sudo command, can still access the root account. For more information about PAM, refer to Section 42.4, “Pluggable Authentication Modules (PAM)”. Rather than completely denying access to the root user, the administrator may want to allow access only via setuid programs, such as su or sudo. 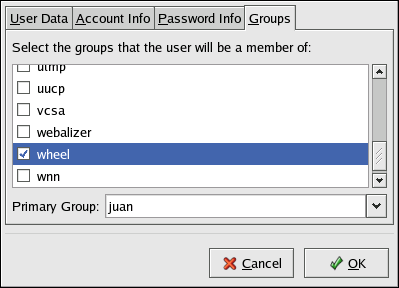 In the previous command, replace <username> with the username you want to add to the wheel group. You can also use the User Manager to modify group memberships, as follows. Note: you need Administrator privileges to perform this procedure. Click the Groups tab, select the check box for the wheel group, and then click OK. Refer to Figure 42.2, “Adding users to the "wheel" group.”. Figure 42.2. Adding users to the "wheel" group. In the above example, <command> would be replaced by a command normally reserved for the root user, such as mount. Users of the sudo command should take extra care to log out before walking away from their machines since sudoers can use the command again without being asked for a password within a five minute period. This setting can be altered via the configuration file, /etc/sudoers. The sudo command allows for a high degree of flexibility. For instance, only users listed in the /etc/sudoers configuration file are allowed to use the sudo command and the command is executed in the user's shell, not a root shell. This means the root shell can be completely disabled, as shown in Section 42.1.4.2.1, “Disabling the Root Shell”. This example states that any user can issue the command /sbin/shutdown -h now as long as it is issued from the console. Many services under Red Hat Enterprise Linux behave as network servers. If a network service is running on a machine, then a server application (called a daemon), is listening for connections on one or more network ports. Each of these servers should be treated as a potential avenue of attack. Script Vulnerability Attacks — If a server is using scripts to execute server-side actions, as Web servers commonly do, a cracker can attack improperly written scripts. These script vulnerability attacks can lead to a buffer overflow condition or allow the attacker to alter files on the system. Buffer Overflow Attacks — Services that connect to ports numbered 0 through 1023 must run as an administrative user. If the application has an exploitable buffer overflow, an attacker could gain access to the system as the user running the daemon. Because exploitable buffer overflows exist, crackers use automated tools to identify systems with vulnerabilities, and once they have gained access, they use automated rootkits to maintain their access to the system. The threat of buffer overflow vulnerabilities is mitigated in Red Hat Enterprise Linux by ExecShield, an executable memory segmentation and protection technology supported by x86-compatible uni- and multi-processor kernels. ExecShield reduces the risk of buffer overflow by separating virtual memory into executable and non-executable segments. Any program code that tries to execute outside of the executable segment (such as malicious code injected from a buffer overflow exploit) triggers a segmentation fault and terminates. Execshield also includes support for No eXecute (NX) technology on AMD64 platforms and eXecute Disable (XD) technology on Itanium and Intel® 64 systems. These technologies work in conjunction with ExecShield to prevent malicious code from running in the executable portion of virtual memory with a granularity of 4KB of executable code, lowering the risk of attack from stealthy buffer overflow exploits. cupsd — The default print server for Red Hat Enterprise Linux. lpd — An alternative print server. sendmail — The Sendmail Mail Transport Agent (MTA) is enabled by default, but only listens for connections from the localhost. When determining whether to leave these services running, it is best to use common sense and err on the side of caution. For example, if a printer is not available, do not leave cupsd running. The same is true for portmap. If you do not mount NFSv3 volumes or use NIS (the ypbind service), then portmap should be disabled. Red Hat Enterprise Linux ships with three programs designed to switch services on or off. They are the Services Configuration Tool (system-config-services), ntsysv, and chkconfig. For information on using these tools, refer to Chapter 15, Controlling Access to Services. If unsure of the purpose for a particular service, the Services Configuration Tool has a description field, illustrated in Figure 42.3, “Services Configuration Tool”, that provides additional information. Checking which network services are available to start at boot time is only part of the story. You should also check which ports are open and listening. Refer to Section 42.2.8, “Verifying Which Ports Are Listening” for more information. Potentially, any network service is insecure. This is why turning off unused services is so important. Exploits for services are routinely revealed and patched, making it very important to regularly update packages associated with any network service. Refer to Section 41.5, “Security Updates” for more information. Remote memory dump services, like netdump, transmit the contents of memory over the network unencrypted. Memory dumps can contain passwords or, even worse, database entries and other sensitive information. Other services like finger and rwhod reveal information about users of the system. All remote login and shell programs (rlogin, rsh, and telnet) should be avoided in favor of SSH. Refer to Section 42.1.7, “Security Enhanced Communication Tools” for more information about sshd. 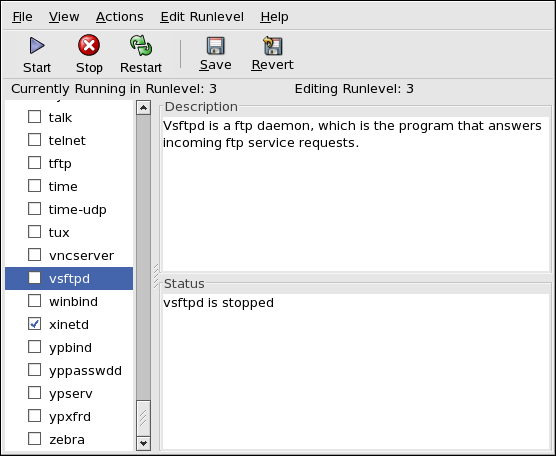 FTP is not as inherently dangerous to the security of the system as remote shells, but FTP servers must be carefully configured and monitored to avoid problems. Refer to Section 42.2.6, “Securing FTP” for more information about securing FTP servers. More information on securing network services is available in Section 42.2, “Server Security”. The next section discusses tools available to set up a simple firewall. After the necessary network services are configured, it is important to implement a firewall. You should configure the necessary services and implement a firewall before connecting to the Internet or any other network that you do not trust. Firewalls prevent network packets from accessing the system's network interface. If a request is made to a port that is blocked by a firewall, the request is ignored. If a service is listening on one of these blocked ports, it does not receive the packets and is effectively disabled. For this reason, care should be taken when configuring a firewall to block access to ports not in use, while not blocking access to ports used by configured services. For most users, the best tool for configuring a simple firewall is the graphical firewall configuration tool which ships with Red Hat Enterprise Linux: the Security Level Configuration Tool (system-config-selinux). This tool creates broad iptables rules for a general-purpose firewall using a control panel interface. Refer to Section 42.8.2, “Basic Firewall Configuration” for more information about using this application and its available options. For advanced users and server administrators, manually configuring a firewall with iptables is probably a better option. Refer to Section 42.8, “Firewalls” for more information. Refer to Section 42.9, “IPTables” for a comprehensive guide to the iptables command. As the size and popularity of the Internet has grown, so has the threat of communication interception. Over the years, tools have been developed to encrypt communications as they are transferred over the network. Red Hat Enterprise Linux ships with two basic tools that use high-level, public-key-cryptography-based encryption algorithms to protect information as it travels over the network. OpenSSH — A free implementation of the SSH protocol for encrypting network communication. Gnu Privacy Guard (GPG) — A free implementation of the PGP (Pretty Good Privacy) encryption application for encrypting data. ssh — A secure remote console access client. scp — A secure remote copy command. sftp — A secure pseudo-ftp client that allows interactive file transfer sessions. Although the sshd service is inherently secure, the service must be kept up-to-date to prevent security threats. Refer to Section 41.5, “Security Updates” for more information. GPG is one way to ensure private email communication. It can be used both to email sensitive data over public networks and to protect sensitive data on hard drives. GRUB also accepts unencrypted passwords, but it is recommended that an MD5 hash be used for added security. This access is still subject to the restrictions imposed by SELinux, if it is enabled.